Chen was born in 1962 in the city of Shen Tan in Hunan province, the same city where the great leader of new China, Mao Zedong was born. Shen Tan is also famous for lotus and gained the reputation of ‘City of the Lotus’. The Chinese regard lotus as a symbol of sacred and purity. Lotus flowers are popular subjects in Chinese paintings and poems for thousands of years. The city of Shen Tan has a long history of more than 1,500 years. It is one of the most important birth places of Hunan culture which is very distinctive in China. Hunan people are great soldiers and artists. There is an old Chinese saying – an army is not an army without Hunan soldiers. Great Chinese painter Qi Baishi (1864-1957) is also a native of Hunan and is regarded as the most prominent master of traditional Chinese water color paintings in the last century. 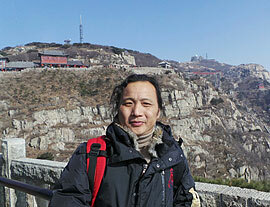 Chen is specialized in oil painting and in the last two decades he had participated in many exhibitions in the country. In 2015, Chen was invited several times to Guiyang city, a gateway to the north-west territories of China, to exhibit his latest works of art.